The modern internal combustion engine is a marvel of engineering. Compared to engines of the early and mid twentieth century, today’s engines are more powerful, more efficient, and orders of magnitude more reliable. These breakthroughs are mainly due to one thing: the engine management system, which is a computer (or multiple computers) that regulate how an engine operates, controlling such parameters as ignition timing, fuel injector pulse width, and cam timing. Those parameters can be adjusted thousands of times per second based on input from a myriad of sensors monitoring things such as intake air temperature, coolant temperature, intake manifold absolute pressure, throttle position, and a host of other things. 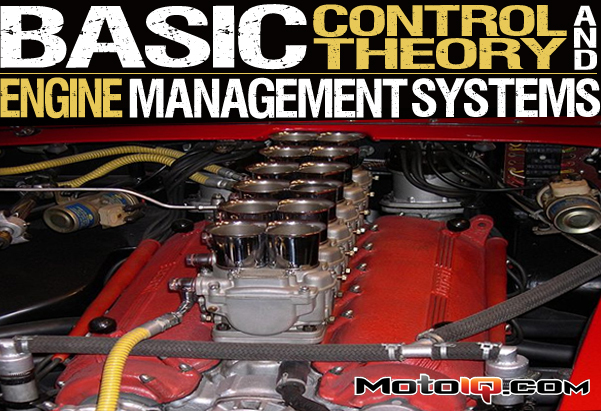 But how exactly does an engine management system (or EMS) work? Learning the answer to that question will help you not only gain a better understanding of how an engine operates, but will also assist in tuning engines. At its heart, the EMS is an electronic control system. 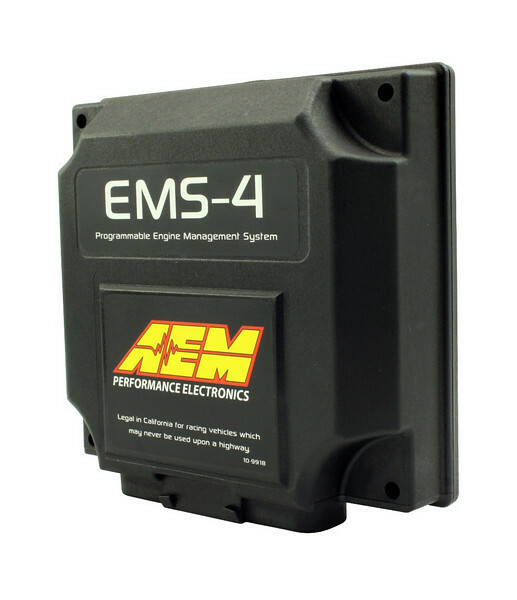 The AEM EMS-4 is an example of a “stand alone” EMS. One that is designed to work in multiple vehicles and on multiple engines. The EMS-4 is specifically designed for four cylinder engines. Control theory is a branch of engineering and mathematics that deals will how to control systems and obtain a desired output. The system that is being controlled is called the plant, and the devices used to control that system are called controllers. There are two main types of control systems: open-loop and closed-loop. A Basic Open-Loop Control System. The open-loop control system is the most basic and has the least amount of functionality. In this type of system, a desired output (sometimes called the reference) is fed into the system. The controller uses the input to drive the plant, producing the desired output. The problem with these systems is a lack of “feedback.” The system is unable to react to changes in its environment because it has no way of knowing what the plant is actually doing. A good example to think of is a cruise-control system on a car. Let’s say you’re trying to get good fuel economy in your 400-horsepower Mustang, so you set the cruise control to 55 MPH. That is your reference. On a level, straight highway, your open-loop control system maintains 55 MPH by maintaining the throttle position. However, as soon as you start to go up a hill, your car decelerates because the throttle position does not change. This is because the system has no way of knowing it needs to change the reference. A closed-loop control system solves this problem by using a feedback loop. The feedback loop allows the system to adjust for changing conditions by utilizing sensors that measure what the current output is. This output is then added or subtracted from the reference (creating the measured error) to enable the system to adjust itself. In our example, the cruise control system uses the vehicle speed sensor (among others) for its feedback loop. When your car starts going up the hill, its speed drops. That difference in speed (let’s say negative 5 MPH) is subtracted from the original reference (55 MPH), giving a total input into the system of 60 MPH, and causing your car to open the throttle wider to get back up to its set speed. When you reach the top of the hill and begin going over the set speed, the system automatically closes the throttle to again maintain the correct speed. Now that we know how a basic control system works, we can start looking at a few examples of different types of engine tuning systems used in cars.